Sales Engagement Platforms (SEPs) emerged in 2016 to become the new Office for Sales Suite. Aragon Research sees them as being key to the success of the enterprise sales team. Currently worth just over U.S. $1 Billion, the market for Sales Engagement Platforms will grow to be worth $5 Billion by 2021, according to Aragon Research Inc. The explosive growth of SEPs is due to the potential they offer—to eliminate the fractured state of sales tools and provide a complete Digital Selling environment, equipped with key capabilities such as advanced Content Analytics. 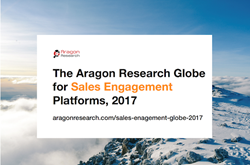 The Aragon Research Globe™ for Sales Engagement Platforms will help CEOs, CSOs, CMOs, and other executive sales leaders understand the current state of the Sales Engagement market and help them evaluate the major providers in this market. The Aragon Research Globe™ for Sales Engagement Platforms covers the technology providers that allow an enterprise to manage all aspects and touch points of the sales process. These providers allow sales professionals to manage and share content in a multitude of forms, communicate with the customer via email, phone, messaging, and video, and understand engagement via advanced content analytics. Aragon Research is the newest technology research and advisory firm. Aragon delivers high impact interactive research, consulting, and advisory services to provide enterprises the insight they need to make better technology and strategy decisions. Aragon Research serves business and IT leaders and has a proven team of veteran analysts. For more information, visit https://www.aragonresearch.com.